Yahoo is reportedly preventing some of its users with ad blockers installed on their computers from accessing their email accounts. Digiday has spotted a thread on the Adblock Plus forums with complaints from a couple of people who couldn't access Yahoo Mail on both Chrome and Firefox. One of them posted a screenshot of the message he got asking him to "disable Ad Blocker to continue using" the service, which you can see below the fold. If you take a close look at the URL, you'll see that it says "reason=ADBLK_TRAP." Update: A spokesperson told us: "At Yahoo, we are continually developing and testing new product experiences. 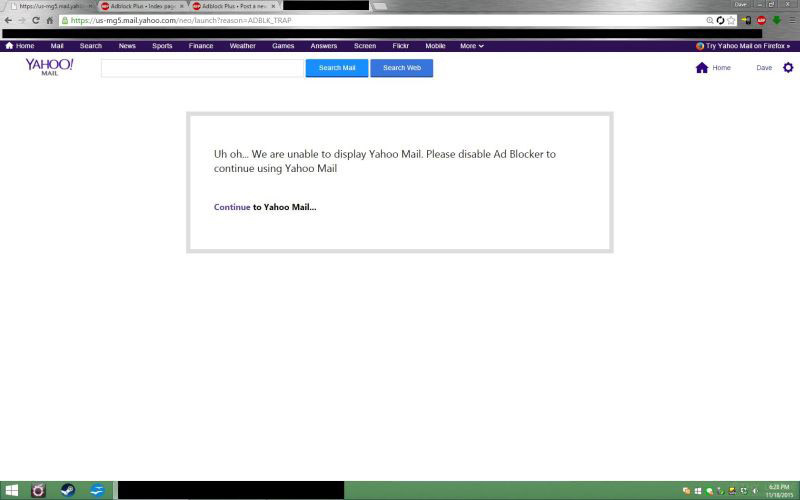 This is a test we're running for a small number of Yahoo Mail users in the US." Even Andrei Herasimchuk -- Yahoo's former Senior Director of Product Design, who once helped revamp Mail itself, and Twitter's former Director of Design -- lamented on the microblogging website that he couldn't access his account. Digiday notes that it's becoming increasingly common for websites to lock out users if they don't disable their ad blockers, with The Washington Post being among the publications that enforced the rule in the past. We've reached out to Yahoo for clarification, and we'll update this post once we hear back. For now, if you're experiencing the same issue, you can try using other browsers or signing in on other devices.